No. you do not. The South Korean market has recently become very competitive so although all majors are accepted, it has become more advantageous if you are an English or Education major. 2. How many class hours are we supposed to teach in South Korea? The standard work week is between 30-35 hours per week. 3. Do I need to speak Korean in order to teach English in South Korea? No, you will be teaching Conversational English and most of the students already know English. 4. What should I take with me to South Korea? The school will provide furnished accommodations which usually include the following: furniture, beddings, cooking utensils, TV, etc. Clothes are very inexpensive in South Korea so you might want to take very little clothes with you. You should try to take a laptop computer, a magic jack and a digital camera for your personal use. 5. Will I need to get any vaccinations before going to South Korea? 7. How will I get from the airport to my lodgings? A member from the school staff will meet you at the airport and take you to your apartment. There is a departure tax when leaving South Korea. You should check with the airline for the current rates. 8. Is it safe in South Korea for visitors? The crime rate in South Korea is very low. The Korean people are usually very friendly to foreigners. You still however should take some precaution while on public transportation or in busy shopping centers. 9. Does it get cold in South Korea? November; Winter: December – Mid March. 10. What is the school’s dress code? 11. What are the emergency phone numbers for South Korea? 12. What is the banking information for South Korea? The Korean currency symbol is the Won. Major credit cards and cash are accepted in South Korea. Some of the most popular banks in South Korea are: Korean Exchange Bank and KB Kookmin Bank. 13. What’s the exchange rate between US Dollars and Korean Won? Exchange rates fluctuate periodically and also vary between banks. Please visit www.xe.com for current conversion rates. 14. Is it possible to send money home? Yes. Money can be easily exchanged and transferred to bank accounts around the world. Western Union services are available. 15. How does the school year run in South Korea? 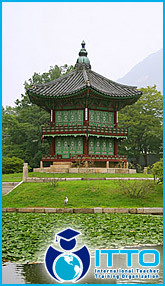 In South Korea, the two main semesters start in September and February. 15. Is there an age limit to teach English in South Korea? Unfortunately, South Korea is a bit more difficult and their age limit is 45 years old. 16. What is the average cost of living in South Korea? The cost of living ranges from $700 USD to $1,900 USD for a single person. This includes accommodation, electricity, water and gas bill, internet, food, cellphone, daily commute, doctor and any other minor expenses. However, since our TEFL Job Offer program in South Korea provides a furnished apartment, you are only responsible for your own food and utilities. The average person is able to save more than half of the monthly salary.